Sky Echo – Poor Man’s TCAS! This is a very short look at the practicalities of the, now replaced, uAvionix Sky Echo ADS-B in/out device. Originally around £600 I got hold of one for a fraction of that price as I wanted another GPS unit to feed SkyDemon, with the added benefit of being able to see some traffic at the same time. The Sky Echo is capable of broadcasting ADS-B out as well as receiving the signal and displaying the data within electronic flight bag software. The device is also a little tricky to mount (at least in the RV). I have opted for 3M velcro to stick it to the top of the seat rail inbetween the pilot and passenger seats. Battery life is good, if you remember to turn it off after flying and to charge it before you need it! The stick out aerial has proven cumbersome as I sometimes catch it with my arm or a seat belt. When flying around with the vertical filters removed the majority of traffic shown on screen will be airliners in the flight levels, as the majority of these are pushing out ADS-B. Lower down, there are far fewer aircraft broadcasting this so the Mk1 eyeball is still absolutely relevant. Whilst flying around Brize Norton’s airspace recently I was told to expect traffic head on within 500ft above. A quick glance down at my iPad showed an RAF C-130 heading toward me. The SkyEcho 2 is now shipping to the UK. 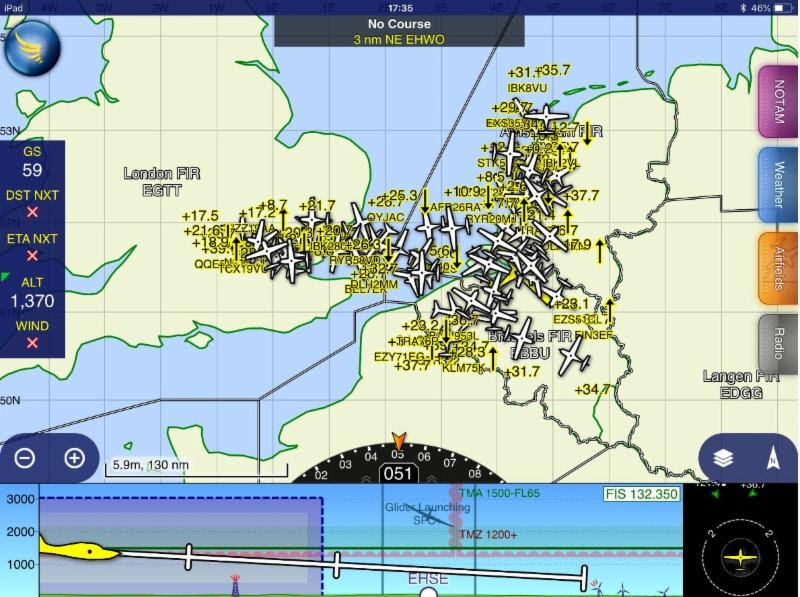 The new model is easier to use as it sticks to a window, it offers better ADS-B receive performance, comes with native FLARM functionality as well as UAT weather and traffic as part of a SkyDemon trial for UAT in the UK. Below is a supposed screenshot showing the version 2’s reception. I think that in time we will move onto the SkyEcho 2.